After the birth of my fourth child, I had lost all core strength and my bladder was on a “no jumping allowed” status - even sneezing was cause for concern for me. Adding Boat Pose into my daily yoga practice strengthened my core which made me stronger in all my yoga poses, relieved my low back pain and joyfully allowed me to jump and sneeze without concern. Adding Boat Pose to your personal yoga practice will help you to strengthen your core and help build full body strength. Boat pose tones the abdominal muscles while strengthening the low back. 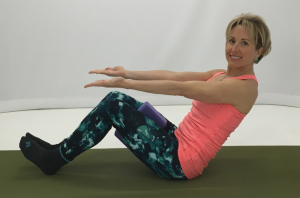 Adding props can also help to strengthen the transversus abdominis - the power house of our core strength. Add a block between the legs to create a “bhanda” or lock in the core. Placing the block between the legs engages the muscles of core (uddiyana bandha) and pelvic floor (mulabandha). 1. Start seated and place the yoga block between the inner thighs - avoid placing between the knees. 2. Ground the heels and point the toes up, squeezing the yoga block with your legs to engage the core. 3. Keeping your spine straight, chest out, lean back slightly. 4. Extend your arms forward at shoulder height, palms facing up and hold for 5-10 breath cycles. If you low back starts to feel strained or like it is doing the work, come out of the pose. Focus on building strength slowly so as not to injure your body. 5. For additional support you can also add a weighted ball behind the low back. 6. Options include lifting the legs for full boat or my favorite which is adding side to side rotations with hands at heart center to “whittle the waistline”. Do not practice Boat Pose if you are currently experiencing headaches, low blood pressure, or diarrhea. Those with heart problems and asthma should not practice the full variation of the pose, but should gradually and softly practice Half Boat Pose instead. Women who are pregnant or menstruating should also not practice Boat Pose. Those with neck injuries can practice this pose with their backs and heads supported against a wall. Always work within your own range of limits and abilities. If you have any medical concerns, talk with your doctor before practicing yoga.